I redrill the factory 5x4 front hubs and use RX-7 front rotors, the calipers are wilwood 4 piston (not installed yet) but prety easy to do by just fab a 3/16 brackets that bolt it on the spindle, weld 2.0 wheels and 165/80-15 street tires, this is a custom brake that really works and cheap less than $200 for it and my work fabricating the setup, it will use stainless braided brake lines. Everything is looking really good. Do you have a date you would like it done by? Thanks guys, i really dont have a deadline for it this is a canvas that will be open to changes and never bieng finished going tru diferent stages, i will build it and paint it in satin black without fixing anything on the body till i can afford a real paint job, i know that will take another disassemble but i like to flex my muscles so that will be ok with me, i like to race it now and then at the local tracks just to see what it will be capable of, but this is not a race car by any means! I am still waiting on some eddy alum. heads and forged pistons to send my engine to the machine shop, and still debating on wich cam i will install-and what kind of cam i may go with, a solid flat tapped 540something lift comp cam or a big hydraulic, but not deside yet, as well as the carb 850 DP is whats comming first to maybe change to an EFI later on, i will fabricate my own 2 inch primaries headers like the pro parts or very similar, and also not deside yet on the rear suspension set up, i got 2 options for it, and one is keeping the stock leaf spring setup and add a set of caltracks or build a custom unequal lenght 4 link setup with coilovers, but lets see what happen when i get there, i got alredy the spring relocation kit from mancini and i will use it in eather one i deside! May I suggest a hydralic roller cam. It's a bit more expensive, but you'll get a much more aggressive cam with a very broad torque curve. Not to mention that you won't have to brake in the cam and you can reuse the lifters if you decide to go bigger! Are you going stroker? If so and haven't got your parts may I suggest looking at manciniracing.com for good quality parts and good pricing! I bought an unbalanced 493 kit for $1450! Eagle hrods, crank and Diamond pistons! I'm having my local machine shop balance mine and save $100. A litlle front end change i think it looks better with this grill! The Demon look is sweet,, I like it! It is a 72 Dart but thanks for the comment anyways! Oh no,, I know its a Dart. I meant that with the new grill it has that Demon look to it. LOL!! sorry. LOL!! Yeap your are right, i always like that DEMON grill, IMO the best looking A body Dodge grill ever! Yeap that is the Plymouth A body most beautiful grill IMO! 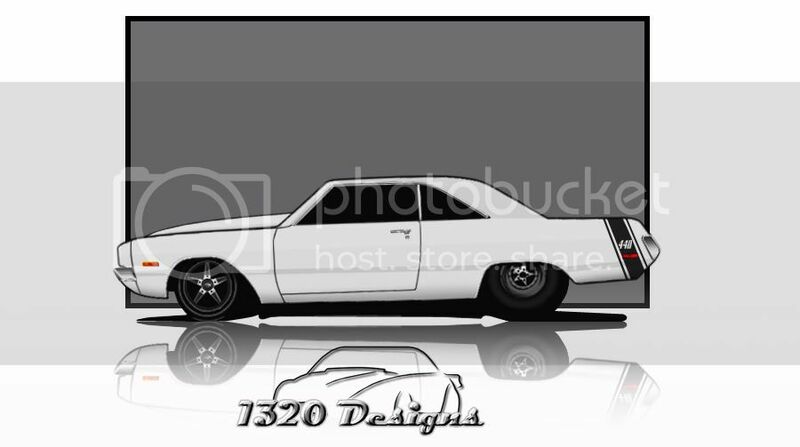 This is the rendering i got made yesterday for my car this is how it should look when i finish with it, I hope!